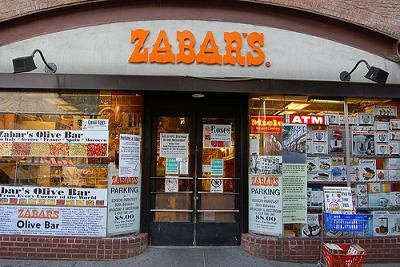 The other day I stopped at Zabar’s. There was a time that I went there weekly though I lived seventy-five blocks further uptown. This was before the food revolution, and the store was the closest one to fill some of my needs: good coffee, a superior selection of cheeses, freshly baked sour rye with a decent crust, dark chocolate, paté, and hard salami. One of my pleasures then was to buy “meat ends.” They were easy on my wallet, but like a grab bag provided surprise. Would I end up with headcheese, sopressa, liverwurst, chorizo, Westphalian ham or, heavens forbid, Bologna or overdone roast beef? On my recent visit to the store, one of the old deli men was still on duty. He smiled when I asked for Landjaeger, a type of hard German sausage that typically comes as a pair of narrow twinned strips. The sausage was so desiccated that it needed no refrigeration and was consumed by hunters (Jaeger) on long treks. “Yes,” my old friend said, “but its shape” has changed. (In its present moist incarnation the sausage is a pale reminder of its former self.) I also bought Liptauer–cream cheese flavored with paprika, caraway, anchovies, and pepper–which also brings back childhood memories. I have always loved food, but from way back my tastes have been very specific. I loved my childhood evening meal, which included salads, hard salami, Gruyere cheese, Westphalian ham, new potatoes, and fresh asparagus when in season. I mostly hated the main noontime meal, of chicken boiled to “death” until its skin was loose and flabby, or Irish stew, whose fat congealed and clung to my lips, or revoltingly acid Sauerkraut. I mostly loved broiled foods with their own characteristic taste. Though my repertoire has expanded over the years, I still feel that way. In my time, children had to finish their plate–a difficult task when one hates a particular food. My parents’ inflexibility taught me an unexpected lesson. When I was about five, my mom and I were locked in battle over the fate of a portion of spinach that I simply refused to finish. I could not leave the table until I had eaten it, and my mother was prepared to sit it out. Mercifully the telephone rang and she went to answer it in the adjoining room. While she was gone I buried the offending vegetable in a nearby flowerpot and returned to my seat. When my mom came back she praised me for having complied with her demands. Were adults so easily fooled or had my mother such implicit faith in my honesty? I remember being pained by having to lie, but then I still can feel the revulsion with which I contemplated the spinach that particular day. If necessary, I concluded, survival might require cheating. This entry was posted in Uncategorized and tagged childhood stories, cold cuts, german food, honesty, landjaeger, liptauer, new york city, new york institutions, picky eaters, zabar's. Bookmark the permalink.